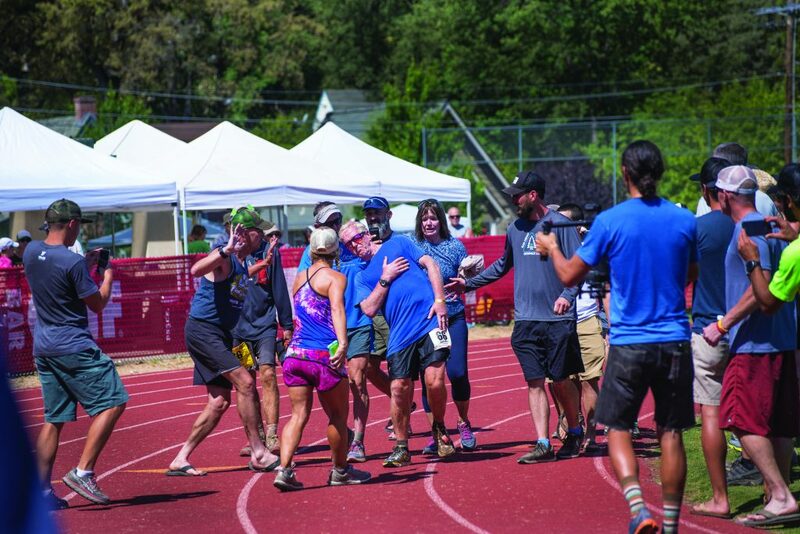 With less than 20 minutes left before the 30-hour cutoff at the 2017 Western States 100, cheers erupted as Scotty Mills reached the Placer High School track in Auburn, California. Blond-haired, with boyish looks and a trim physique that make him seem younger than his 66 years, Mills would be crossing the finish line of this legendary ultra for the 18th time. But the crowd’s enthusiasm turned to alarm as he wobbled and stumbled around the track, his torso leaning right at a 45-degree angle. He held his right hand to his chest, as if trying to correct his balance. His shoulder drooped toward his hip. Suddenly, he fell. “Don’t touch me!” he yelled, knowing that hands-on aid would disqualify him. As Mills lay on the track, his friends and wife, Jean, hovered nearby with concern etched on their faces. After a few seconds, Mills struggled to his feet and resumed walking, his torso still leaning. As he crossed the finish line and pumped his fists in the air, the clock read 29:44—a triumphant but bittersweet finish for someone who had finished each of his prior 17 Western States in under 24 hours. Contemplating “next time” is key to Mills’ longevity and his ability to keep running 100-milers—one of the few in his over-65 peer group to do so. 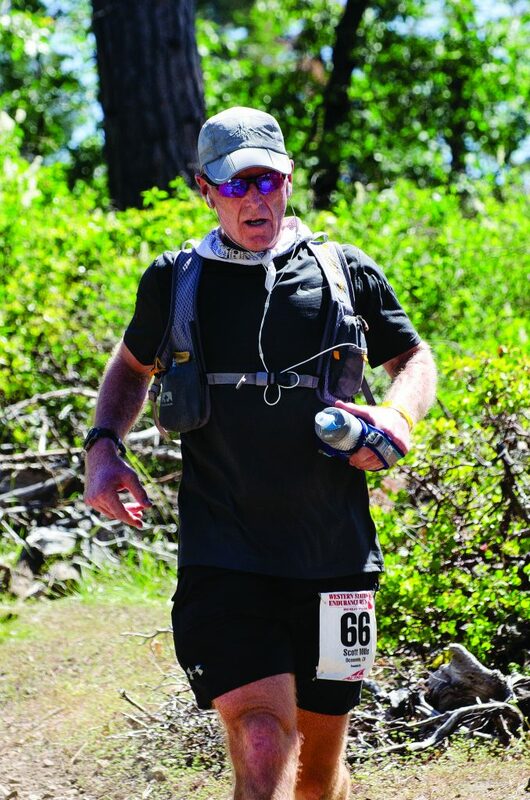 Over nearly four decades of ultrarunning, Mills has racked up finishes in some 200 ultras, including eight finishes at Colorado’s brutal Hardrock 100. Last summer, he hoped to finish Western States and Hardrock—two of the country’s toughest (and toughest-to-get-into) 100-milers—just weeks apart, to get closer to his goal of 20 Western States and 10 Hardrock finishes. Mills’ devoted relationship to running began around the time he met his wife, Jean, 40 years ago when he moved to Sacramento, California. Growing up in northern New Jersey, Mills had been an avid soccer player and attended the United States Air Force Academy on a soccer scholarship. He moved to Sacramento after graduation to become a Navigator Training Officer at Mather Air Force Base, where Jean also worked as an officer. Mills needed to stay in shape, so he began running casually and soon made friends through Sacramento’s Buffalo Chips Running Club. He progressed to his first marathon, the 1978 Bidwell Classic in nearby Chico, the same year he and Jean got married. After the inception of the Western States Endurance Run in nearby Auburn in the mid-1970s, Sacramento became a hub for the first generation of ultra-distance trail runners. Mills caught the bug, and, in 1981, at 30, ran the American River 50 in 8:14. A year later, he finished his first Western States in 21:29. 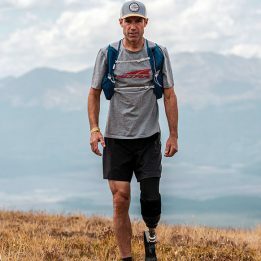 Over the next couple of decades, in his 30s and 40s, Mills ran several ultras that would become classics, such as the Leadville 100 and JFK 50 (four finishes at each). In 1992, at the age of 41, he earned his 100-mile PR at the Vermont 100 with a time of 17:04. Running as the Silver Legend Entry, Mills at the 2017 Western States, sporting a bib number equaling his age. Photo by Tonya Perme. Always supporting other runners at events, Mills quickly built a reputation for selflessness and congeniality. 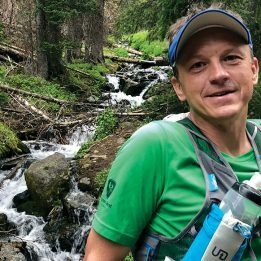 Ultrarunner Andy Jones-Wilkins of Charlottesville, Virginia, recalls that every year Mills didn’t gain entry to Western States, he volunteered at an aid station. Trent tripped and fell, and “about 10 seconds later, I felt a pair of strong hands underneath my armpits. Before I could protest, I’d been pulled to my feet, and a man with blond hair and wondrously caring blue eyes told me everything was going to be OK, and that we needed to run together for a while. To that end, Mills took up the reins as a race director. In 1993, when his and Jean’s Air Force careers transferred them to Washington, D.C., he became involved at the grassroots level with the Virginia Happy Trails Running Club, which had been formed a year earlier to support the inaugural Bull Run Run 50. In 1996, when the race’s founder moved away, Mills took the helm directing the Bull Run Run 50. He would do so for the next nine years. Mills nearing the finish line of the 2017 Western States 100, with his wife, Jean, directly behind him. Photo by Tonya Perme. Following his retirement from the Air Force in 1995, Mills managed two Fleet Feet running-store franchises in northern Virginia. During one year’s brutally hot conditions, for example, Mills realized that runners would overheat in the final miles and managed to get extra ice, water and Coke to a remote location between aid stations. To date, Mills has failed to finish only a couple of races. The DNF he calls “the monkey on my back” happened at the 2013 Western States 100. Some 70 miles into the race, he developed an uncontrollable sideways tilt. It didn’t hurt, but as the miles passed, the lean worsened and caused him to fall repeatedly. His pace slowed to about 40 minutes per mile, and he dropped out with 10 miles to go. Medical experts aren’t sure what causes some ultrarunners over the age of 55 to develop a noticeable lean late in their run, or even how common the problem is. Dr. Marty Hoffman, a former research director for the Western States 100 who specializes in studying ultrarunners, theorizes that a tight iliopsoas muscle (located on both sides of the hips) could be an underlying cause. After that 2013 DNF, Mills learned all he could about his trouble with leaning and concluded that core strength, hydration, electrolytes, heat and a past history with lower-back pain all may play a roll. He dedicated himself to improving these factors, mostly through yoga, Pilates and core conditioning. 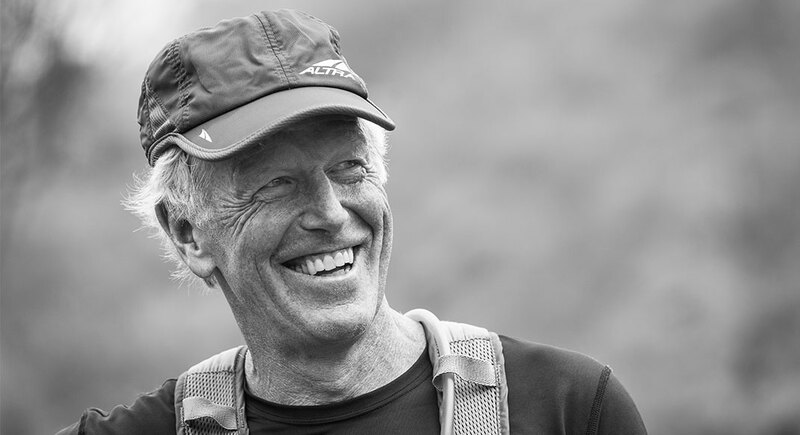 The following summer, in 2014, at the age of 63, he finished the Hardrock 100 and the 105-mile Ultra-Trail du Mont-Blanc about six weeks apart—without leaning. Mills believes that cooler temperatures, a slower pace and the use of trekking poles (which are prohibited at Western States) all worked to his advantage. Despite age, and the confounding lean, Mills wants to attempt Western States and Hardrock at least a couple more times each, in order to reach the coveted round numbers of 20 and 10 finishes, respectively. Given the long-shot lottery odds, Mills didn’t think he’d get another chance at Western States. But, in 2017, a special opportunity arose: the “Silver Legend Entry,” which was created to honor longtime Western States race director Greg Soderlund, who passed away in 2016 and was a friend of Mills. The award grants entry to a qualified runner age 60 or older who has given back to the sport of ultrarunning in significant ways. “Scotty was a very easy choice for the first year of the award, because precious few individuals have given as much as he has over the years,” says Medinger. Mills also lucked out with the 2017 Hardrock 100 lottery, earning a spot at what would be his ninth attempt at the iconic Colorado race. He had run the States-Hardrock double—the two events, three weeks apart—three times before, but not since 2001. Could he do it again? “When I got the opportunity for the Greg Soderlund award, I felt a lot of pressure to respect and honor that gift, so I trained super hard,” Mills says. He increased his mileage on vertical terrain and redoubled his commitment to building core strength. During peak training last spring, he ran the Lake Sonoma 50 in a confidence-building 10:11—a time that many runners half his age would envy—without leaning. But Western States had an inauspicious start. The 2017 edition tested many runners’ resolve in its first 15 miles, with deep snow and mud. Mills came into his first crew meeting about an hour later than expected. Shartel, his pacer, says he told the crew, “That was the toughest 30 miles I’ve ever been through at States,” and that a sub-24-hour finish was out the window. He made it to the finish with 15 minutes to spare. As Jean and his friends escorted him to the medical tent, he reassured them that he was OK.
As soon as Mills finished Western States on June 25, he faced a tough decision: Should he pull out of the July 14 Hardrock 100, or go for it? Rather than stay home, though, he and Jean traveled to Colorado as planned. Mills helped with course marking and aid-station preparation. Then, during the 48 hours of the event, he crewed and paced another legendary ultrarunner Betsy Kalmeyer, who, at 56, is an 18-time Hardrock finisher. 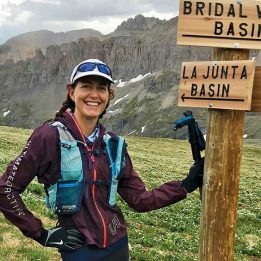 Mills met Kalmeyer at the mile-56 Ouray aid station and sat by her side for three hours as she lay on a cot suffering nausea and fatigue, gently coaxing her to eat. “He was really patient,” Kalmeyer recalls. Mills hiked by her side as she set the pace. Several miles in, as the pair ascended the Camp Bird Mine Road, Mills noticed another runner who neeeded help with his trekking poles. He ran ahead to offer advice. “He wasn’t just concerned about me—he was concerned about everyone else around, too,” Kalmeyer recalls. After pacing Kalmeyer for 28 miles, Mills headed to the mile-89 KT aid station, where runners were shivering in the nighttime cold. Mills threw a blanket around the shoulders of a friend. He’s feeling more confident about his ability because he pulled off a strong, upright finish at the Cuyamaca 100K in October in 15:12, which he attributes to running at a lower intensity and managing heat better than he did at Western States. Thinking ahead to the 2018 Western States, Mills says, “I’d love to run around the track upright and with a good stride, regardless of the time.” Meanwhile, he’s accepting a slower pace and building more recovery into training. Sarah Lavender Smith is a contributing editor to Trail Runner and author of The Trail Runner’s Companion: A Step-by-Step Guide to Trail Running and Racing, from 5Ks to Ultras. An inspiration to all of us fellow San Diego runners!